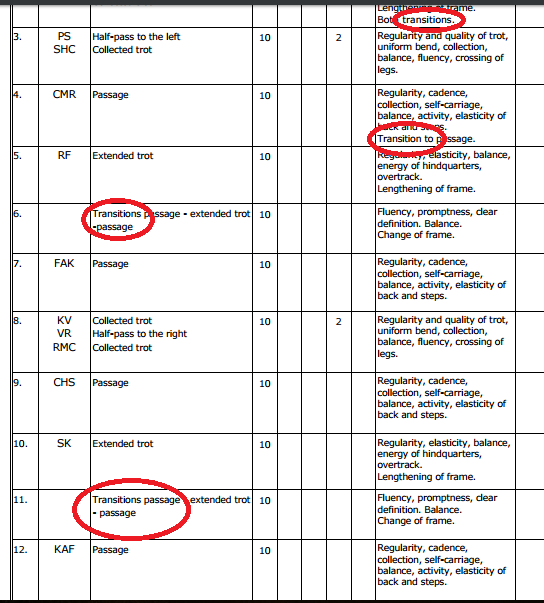 ARTICLE 407 THE TRANSITIONS The changes of pace and variations within the paces should be exactly performed at the prescribed marker. 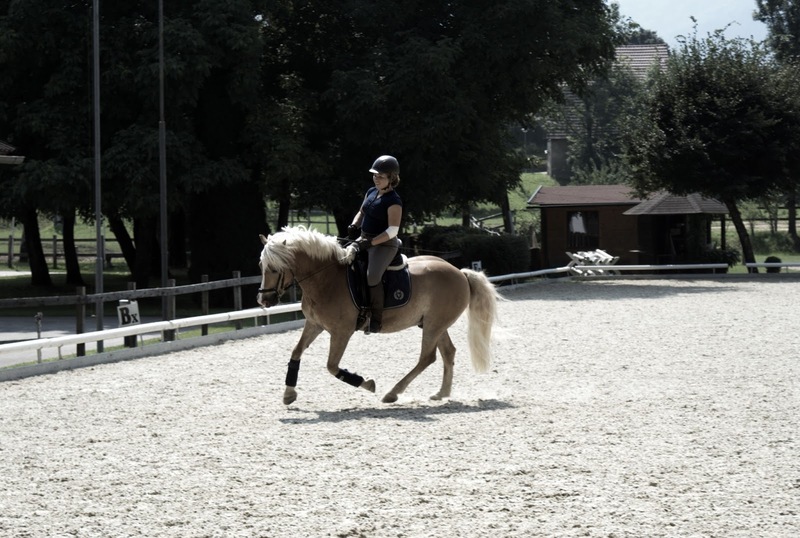 The cadence (except in walk) should be maintained up to the moment when the pace or movement is changed or the Horse halts. The transitions within the paces must be clearly defined while maintaining the same rhythm and cadence throughout. The Horse should remain light in hand, calm, and maintain a correct position. The same applies to transitions from one (1) movement to another, for instance from passage to piaffe or vice versa. 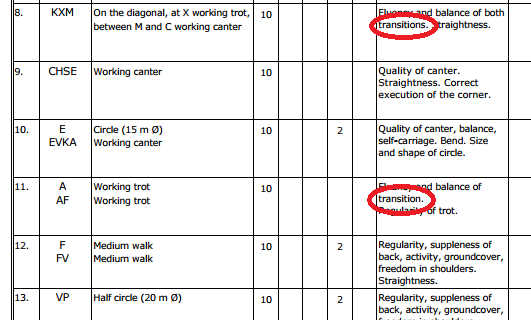 So we need to break up the transitions in several groups as we see different problems with them: the upward transitions (from walk to trot), downward transitions (from canter to walk), within the gaits transitions. The upward transitions should be prompt: you ask for trot, there should be trot. No dragging, no waiting, immediate response would be what we are looking for. For me especially, I need to make sure that Hafl is round and does not use his neck against me in the upward transition. Again, preparation is everything: if you let your horse fall asleep in walk and then, all of a sudden, ask for trot, the reaction might be a shaking head, swishing tail and what not. Here is where half halts come into play (more on that in a later episode, let's just say for now: a little rebalancing). You make your horse aware that there is something coming up but not like WHOOT WHOOT trot is just around the corner (hell yeah, I do that a lot). Be precise in whatever you are doing, get your horse through and soft in the hand, a little leg and off we trot. Same goes for canter departs of course, a movement many are struggling with. The canter depart needs even more preparation: inside bend, inside leg, half halt, lift your inside hip, release the inside rein and outside leg back with the help of the forward driving inside leg - all at the same time, what did you think? What's more, it is not only the combination of aids, the preparation of the transition, no, it is also the right moment (not only now things are getting really complicated). Good timing is as important as good preparation as precise aids - any further questions why you cannot do too many transitions? The downward transitions can be tricky. too. Too often they are with the hands only and end up on the horse's forehand. Whatever transition you make, your horse needs to carry his weight behind and close from behind. Like a wave approaching you from the back - not like one you are running into! All the downward transitions should look like the "happened": no canter, STOOOOOP, trot, but canter and smoothly into trot. And that is the tricky point. To let those transitions happen. What I (and others) do most of the time is simply too much. Rein, leg, seat and breathing and SCREAMING. No, that is too much. Sit a little deeper, breathe out and lower your legs and let it happen. As little rein as possible, just some half halts to get your horse to carry more weight on his hindlegs. That's it. As simple as that. What helped me most was to simply think that I need to start riding the new gait. 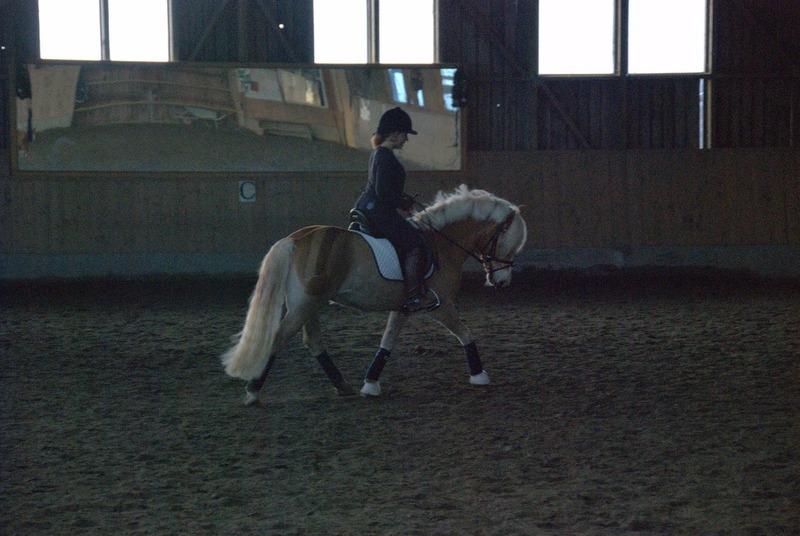 For example, you canter. When you want a trot transition, just think of trotting, of how you would move in sitting trot - that should help changing your posture and preparing you and your horse for the transition. And stop pulling the reins - let them go! Well, I mostly said that to myself....Canter to walk and I make Hafl use his head for rebalancing - this needs to stop. He needs to carry himself, I am responsible for taking care of timing and correctness of the aids and that's it. Easy, isn't it? Will we ever get rid of transitions? No, they will get even more important the further we move on the ladder of dressage. See below two screenshots, one from a children test, one from the Grand Prix. Note that transitions get separate marks as well! Go on now, and ride every transition like in a test - in the Grand Prix, you can even get tens for them!